A total of 15 suppliers on 6th February received awards in various categories at YFAI’s European headquarters in Neuss. YFAI awards the prize for its European suppliers in six categories to companies from the plastics, resins, chemicals, foams, trim, and metal components industries. The categories the suppliers were rated on were quality, cost, customer satisfaction, development, technology and innovation, as well as service. Depending on the total number of points achieved, the companies were presented with a “Supplier of the Year,” “Distinguished Supplier” or “Supplier Excellence” award in various categories. BASF from Germany, a leading supplier of primary components, systems, and specialties made from polyurethane for the global market, is delighted to have been awarded “Supplier of the Year” for the second time in succession. The “Distinguished Supplier” Award went to five international suppliers: Beaulieu Fibres International from Belgium, SFS Group Austria GmbH from Austria, and Mürdter Metall- und Kunststoffverarbeitung GmbH from Germany, as well as the two Chinese companies Everwill Industrial Ltd. and Xin Point Corporation. Nine suppliers received the “Supplier Excellence” Award for technological innovation, service, quality, and customer satisfaction. Polyvlies Franz Beyer GmbH is a German company that is pleased with the recognition of its performance through the Technology Innovation Award. The fiber mat supplier from North Rhine-Westphalia has over 160 years of experience in the textile industry and alongside the innovation team at YFAI developed glass fibers and visible natural fibers for use in door panels. “For us this fantastic recognition of our work is also an incentive to do even better,” explained Ludger Löbbers, Managing Director at Polyvlies. 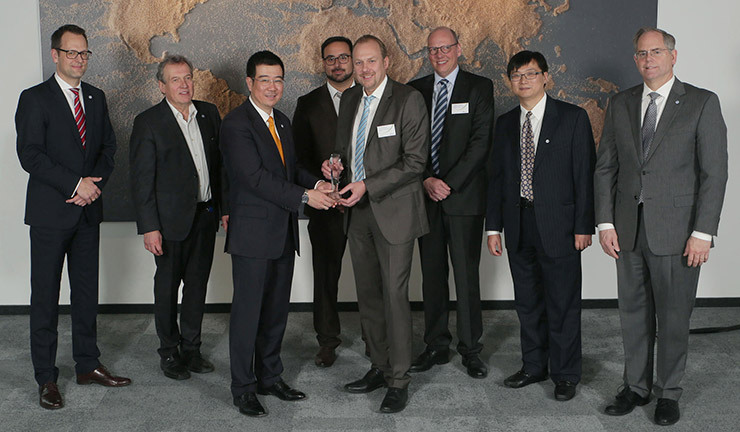 One Chinese company, Sunway Automotive Industry Co., Ltd., and three German companies received awards in the “Service” category. They include Polydesign Systems, Halung GmbH & Co. KG, and Müller-Technik GmbH. The “Supplier Excellence” Award in the “Quality” category went to Czech manufacturer Mürdter Dvořák, lisovna, spol. s r.o., while two German companies, ISO Flock GmbH and ETG Elastomer Technik Gedern GmbH, along with Lys Fusion Poland Sp. z o.o. from Poland, received the award in the “Customer Satisfaction” category.